Group I verbs are the most common family of verbs in the Lebanese language, making over 27% of the total of verbs. They share similar forms of conjugation in the past, present and imperative. Those verbs are classified by wazin* and by participle. Group II verbs are the second most common family of verbs in the Lebanese language, making about 25% of the total of verbs. They share similar forms of conjugation in the past, present and imperative. Those verbs are classified by wazin* and by participle. 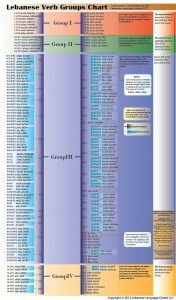 Group III verbs form about 45% of the Lebanese verbs with forty three subgroups. Each subgroup shares similar forms of conjugation in the past, present and imperative. The verbs within each subgroup are classified by wazin* and by participle. Group IV includes about 1% of the Lebanese verbs and has thirteen subgroups. Each subgroup shares similar forms of conjugation in the past, present and imperative. The verbs within each subgroup are classified by wazin* and by participle. The verbs in this group are less likely to be used in daily speech.